Miami Trace senior Mitchell Creamer drives on Hillsboro’s Matthew Ryan during an SCOL game at Hillsboro Friday, Jan. 27, 2017. HILLSBORO — The Miami Trace boys came to Hillsboro knowing they were going into a tough game — historically, Hillsboro High School has been a tough play venue for the Panthers — and the Hillsboro Indians put up the expected fight. However, despite an energetic first three quarters from the home team, the Panthers turned up the heat in the fourth and snatched the win at 69-56. 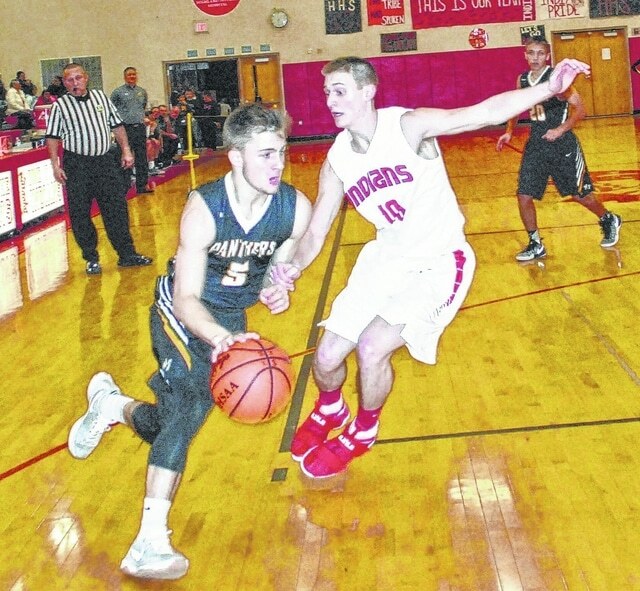 The Panthers got some help from East Clinton as the Astros defeated Wilmington Friday, 54-41. Miami Trace now has a two-game lead over the Hurricane in the SCOL (in the loss column). However, Chillicothe kept pace, barely slipping by Clinton-Massie, 76-73. The Cavaliers are now in second place alone at 8-2. Senior Blake Pittser was the game’s leading scorer for Miami Trace with 18 points. He hit four three-point field goals. Pittser led the Panthers with eight assists. Miami Trace had a season-high 12 three-pointers on the night. Junior Cameron Carter scored 18 (with three threes); senior Skyler McDonald had 16 points (including four threes) and DeAndre Pettiford scored 11 points (he hit one three). Pettiford had eight rebounds. Senior Keondrick Bryant led the Panthers with nine rebounds. For the Indians, Ethan Watson led with 16 points, Josh Keets scored 14 and Marshall Ward had 13. Keets led the game with 13 rebounds. Hillsboro jumped out to an 8-5 lead when Ethan Watson put up two 3-pointers in about 20 seconds before the clock hit three minutes in the first quarter. In the second tie of the game, Miami Trace came back with a long three that took the score to 8-8 in the next few seconds. The Panthers stole the lead from Hillsboro at 2:37 with a 2-point shot that took the score to 10-8 Miami Trace. Josh Keets made the third tie of the quarter with two from the freethrow line at 2:18, bringing the score to 10-10. Miami Trace went on a scoring run after that, keeping Hillsboro at 4 points for the rest of the quarter while scoring 8 for themselves. The first quarter came to a wrap with the Panthers up by two at 16-14. The lead changed four times in the second quarter, beginning with Keets throwing a long three that changed the scoreboard to favor the Indians in the first 30 seconds of the quarter. Cam Reed made Hillsboro’s lead a little more comfortable with a 3-pointer at 6:11 that brought the Indians up by four at 20-16, but the Panthers crept back into the lead. Marshall Ward put a stop to it with a quick 2-pointer at 3:15 that tied the score at 24-24, and two freethrows from Kelton Anderson took the score to 26-24, giving the Indians the lead again. Miami Trace responded with a long three at 1:29 that brought the Panthers into the lead to end the quarter. By the half, Miami Trace had held it together at 29-26. Keets was the star of the third quarter, putting up a free throw and two 2-pointers in a row, taking the Indians into the lead at 38-37 before the clock hit three minutes. After that, the teams traded the lead seven times and tied the score once before the quarter ended with Miami Trace ahead by one point at 47-46. Hillsboro scored 21 points in the third quarter against Miami Trace’s 17. After a physical third quarter, the Indians were looking for a win in the fourth, but it was not meant to be. Miami Trace kept Hillsboro at a 9-point gain for the quarter, limiting the Indians’ scoring with a tight defense while going on a scoring run for themselves. The visitors scored 23 points and stayed in the lead for nearly the entire fourth quarter. By the buzzer, Miami Trace had taken the win at 69-56. Watson and Keets led scoring for the Indians with 16 and 14 points, respectively. Miami Trace’s Pittser and Carter tied scoring for the Panthers with 18 apiece. The Hillsboro boys fall to a 3-6 in the SCOL, 3-13 record for the season. On Dec. 13, Miami Trace defeated Hillsboro, 77-53. The Panthers host the Washington Blue Lions Tuesday at 6 p.m.
MIAMI TRACE — Blake Pittser 1 (4)-4-18; Cameron Carter 4 (3)-1-18; Skyler McDonald 2 (4)-0-16; DeAndre Pettiford 3 (1)-2-11; Mitchell Creamer 2-0-4; Seth Leach 1-0-2; Keondrick Bryant 0-0-0; Darby Tyree 0-0-0; Jacob Batson 0-0-0. TOTALS — 13 (12)-7-69. Free throw shooting: 7 of 13 for 53 percent. Three-point field goals: Pittser, 4; McDonald, 4; Carter, 3; D. Pettiford. Combined field goal shooting: 25 of 57 for 43 percent. Three-point field goal shooting: 12 of 27 for 44 percent. Rebounds: 34 (12 offensive). Assists: 15. Steals: 10. Blocks: 3. Turnovers: 9. Personal fouls: 11. Bench points: 34. Second chance points: 4. Points off turnovers: 7. HILLSBORO — Ethan Wilson 2 (4)-0-16; Josh Keets 4 (1)-3-14; Marshall Ward 4 (1)-2-13; Cameron Reed 1 (2)-8; Matthew Ryan 0 (1)-0-3; Kelton Anderson 0-2-2; Ty Haithcock 0-0-0; Mason Swayne 0-0-0. TOTALS — 11 (9)-7-56. Free throw shooting: 7 of 8 for 87 percent. Three-point field goals: Watson, 4; Reed, 2; Keets, Ward, Ryan. Combined field goal shooting: 20 of 54 for 37 percent. Three-point field goal shooting: 9 of 26 for 34 percent. Rebounds: 25 (6 offensive). Assists: 10. Steals: 3. Blocks: 0. Turnovers: 10. Personal fouls: 14. Bench points: 8. Second chance points: 2. Points off bench: 6. Reach David Wright at 937-402-2570, or on Twitter @SportsWrighter.